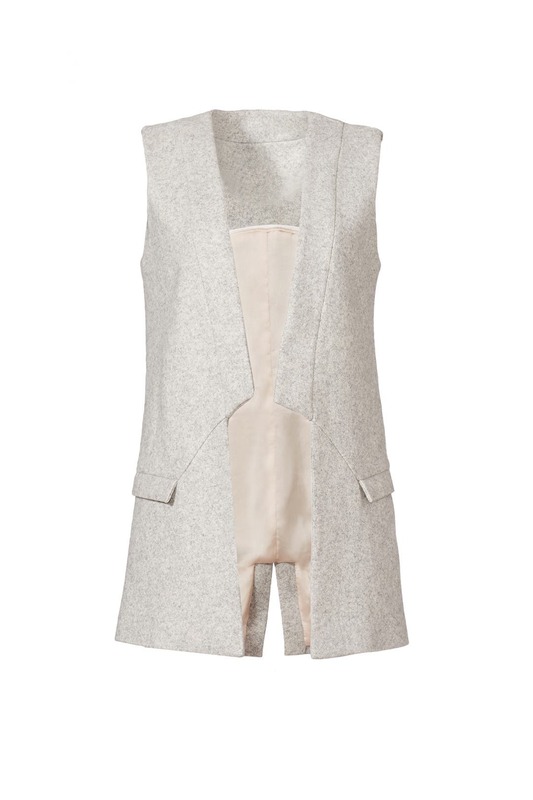 This modern, open-faced Waverly Grey vest is asymmetrical and chic. It'll give your basics a subtle, fresh twist. This vest runs true to size. We recommend going one size up for backup (see following fit notes for exceptions). Grey wool (70% Wool, 30% Polyamide). 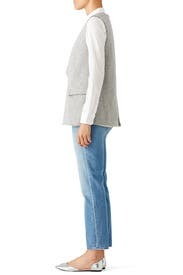 Vest with back slit. Sleeveless. Asymmetrical lapels with two front pockets. Fully lined. 30” from shoulder to hemline. Imported. I loved the look of this vest. It was perfect for work but also looked terrific with jeans. The big issue was that the lining was visible. I tried ironing the lining so it wouldn't show but that didn't work. It totally undermined the polished look of the piece. I would have bought the best in a heartbeat except for the lining issue. I got this for my unlimited. It was a nice outfit addition with a leather skirt. Easy to style and wear with layers. Only thing is the lining looks kinda sloppy in the back as it's not hemmed... I think it's the way the best was made, not from use. 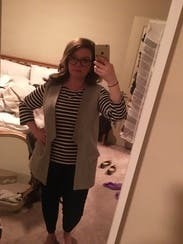 The vest was comfortable to wear and added a nice layer to my basic office outfit. I paired it with a long necklace. 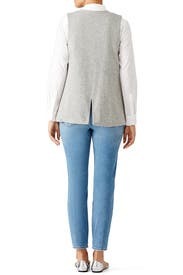 Would also be great for casual weekend outfit with jeans. Would rent again. I wore this once with a DVF blouse available on unlimited (black silk with black sleeves with white polka dots) and slacks and it was perfect for work! In the pic, I wore with a slip dress and longer blouse with the vest and booties! 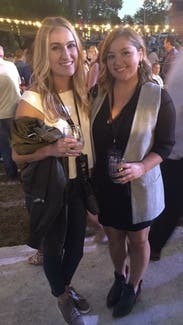 Wore this to an outdoor concert at the beginning of fall & Loved it so much. I'm giving 4 stars tho just because I have a bigger bust and it might be better/look more fitted properly on someone with a smaller chest area! I got ton of compliments on this vest! It worked well with sweater dresses and with sweater and jeans combos. The only thing I didn't like was that the pockets are not real. Only rented size 4 as it was the only one available. Loved it!!! Casual chic!!! Thought About buying it!!!! Great vest that made a great effortless look. Wore it to church with black pants heels then out and about with jeans and loafers. So easy. I wore this to work as part of an Unlimited shipment. Even though it's wool I made it work to wear during summer with a lighter fabric shirt underneath. I'm really tempted to buy this because it fit so well and goes with everything. Highly recommend! Nice piece for work. I struggled with how to style within my own wardrobe, but I rented this piece because I wanted to try something new. I wish I had more to go with this. I rented this through unlimited and decided to try it for work on a more liberal dress code day. I wore with jeans and a blouse. I initially hesitated to wear it since it felt more appropriate for fall but I actually enjoyed having a lighter blazer option for a spring day. The pockets hang outside and are just for looks but overall I enjoyed wearing it and received compliments. It fit as expected. The exterior was gorgeous. I wore it with a black long sleeve shirt and jeans. I was REALLY tempted to buy it but you could see that the inner lining was a little baggy so I decided to just enjoy it that one day. I loved this vest. I wore it with a white blouse and leggings. It hit the mark on the masculine trend without breaking the bank. It was comfortable and flattering. If I were to rent again, I'd size down, as it was a little boxy. I'm a huge vest fan these days - and was so excited to receive this one! I didn't notice in the pictures, but the front pockets are actually little flaps - and look incredibly awkward and bulky in person. This also runs really big - I'm generally a size 12 in RTR and was swimming in the 12. Returned without wearing, totally bummed! Rented through unlimited. 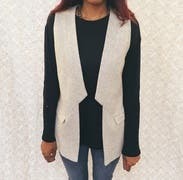 This vest is really fun and easy to wear with just about anything. I found it to be a little itchy where my arms grazed the sides, so had to wear long sleeves under it. Also, the "pockets" are interesting - they're not real pockets (ie, can't put anything in them) and they're not sewn down (see photo). Not a bad thing (they're actually a cool look), just unexpected. Runs very large, ended up pairing it with a cute tunic and it worked out okay. Not for an event, but got lots of wear out of it! 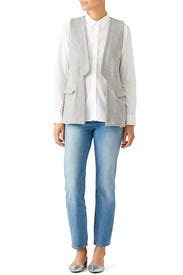 This vest is gorgeous and very lightweight. If you have a larger bust, I recommend sizing up. Cute! Great for work, comfortable and not too long if you are petit like me. I generally run as a 4, sometimes a 6. I got a 6 but definitely could have gotten away with a 4 despite my larger bust. True to size. Looked Great! I got a lot of compliments. I wore this to work and loved it. Great piece. Can be worn with jeans or slacks. Matched with so many of the pieces in my closet so it was extremely easy to test. It fit really well and was easy to style. Loved wearing and got so many complicated. Super unique and cute. It can pair with a lot of different styles--skirts, dresses, jeans, etc. Very versatile. The only problem I had with it is that the lining of the pockets hang SLIGHTLY below the bottom of the vest. it fit true to size and was cute but the piece was very worn. the wool was a little piled. I could tell that it shrank in the dry cleaning because the lining was hanging out the bottom. I wore in once but sent it right back because the piece was too worn-- I was going to wear it with jeans on the weekend but sent it back instead. Love this vest, got tons of compliments on it, and contemplated buying it many times! 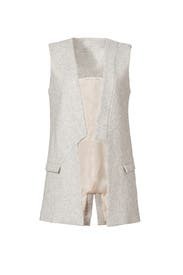 Great vest to spice up everyday casual wear! A must do! It's a little big so I could've definitely worn the 0 but the 2 fit well, too. Great everyday vest. Loved the interesting cut in the front. Tempted to buy it because I know it would be versatile. Can't think of one bad thing about this piece. This is one of my favorite rentals because it was so versatile and I could wear it on top of lots of things. 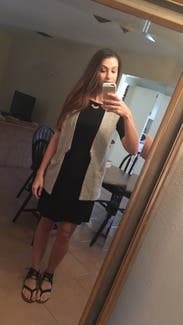 I love this vest and definitely recommend it! Versatile piece for work or more casual spots. Great fit, interesting piece, lots of compliments. It worked great with black pants or jeans. Easy to dress up or down. This vest is pretty diverse. It can be worn like in the model picture or over a dress. I rented for everyday but it could be worn to work too. The reason I give it three stars is because: 1) the pockets are not real 2) the lining on the opposite site of the pockets shows in the front 3) It doesn't reach as far across my chest as I would have liked. I rented this for everyday to wear with jeans, etc. I was surprised to see the front pockets were like "flaps" with the satin "inside" pocket visible on the outside - and it is pink! It makes for an odd design - but still interesting for a single wear. Not sure I will rent again but fit is great. mid-weight wool vest - not suitable for Spring. This vest was absolutely amazing. It's so cute, but still a very casual style. Good with a button down and jeans or a t-shirt and skirt. So cute and so easy to wear. Kind of a felt material so it's totally easy to mix and match with other fabrics and still look professional and pulled together. 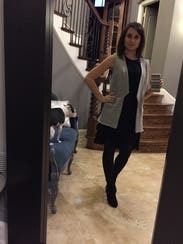 This vest fit perfectly over my black dress and is a great layering piece. It is professional but unique and totally changed my outfit. The sizing felt tailored to me and fit well. I loved how this fit me and will probably rent it again! 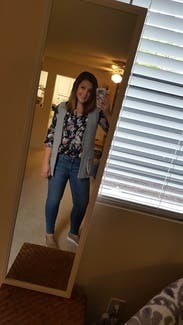 Fun vest to add something extra to every day outfits! The picture doesnt show that the pockets aren't attached to the sides. They are loose and there is a pink satin fabric. I didn't love that--but it was still fun to wear! I have larger hips and I felt I looked a little wide from the front. However - I will probably rent again in winter to wear with a all black outfit.